Somehow i got ahead of myself, and though last week it was three weeks post op. Well now i know the truth it all makes sense as too why i still felt so weak and behind others. So what a difference a week makes, I’ve gone from using One Crutch around the house, and truly thinking it would be like that for a few weeks more at least, then a walking stick. To totally using nothing around the house or indeed short quick trips outside too. And exercising as and when i can, i can’t do as much as before surgery yet, but the wii has been dusted off again, and it’s nice to be moving around once more. The pain is severe in the tail bone, especially in the morning and when i’m stationary for too long, makes me think it’s an arthritis thing as it can be warmed up and allow me to move more freely. But the groin pain i now get on the op side is only when i exercise, so i hope i just need strength to help overcome that one. Still getting dvt pains, but from the old one. As the vein is still blocked up and it’s hard for the blood to actually flow, the pain is in the thigh and the calf. It’s like a dull ache that throbs, so have to rest up my leg quiet often and of course still wear my lovely compression stockings. I need to actually ring up the Physio Lady and make an appointment, as i’m not totally sure on what to do best to build my quads and glutes up. I’m currently doing some old exercises she gave me, such as clams, leg raises, pelvic floors, stationary biking and the free steps on the wii. I want to do more, but i know how easy it is to do more and instantly regret it lol. I have cut down on the medication from Dihydrocodeine to Co-codamol but with physio and me returning to normal duties on the Horizon, i may need them back again. but for now with the gentle slow approach i’m ok . I really hope it stays as i haven’t been on this low amount for the last 5 years!! So it’s looking positive for me for now. The pain i hate the most, is definitely the Right Hand side. The tail bone and groin pain i see as surgery pains that haven’t settled down as of yet, but the Right side feels like damage and it’s haunting me! Hope to be more positive as time goes on, as it’s my New Years resolution ( Pagan’s have their New Year at Samhain/Hallowe’en) as positivity may help me recover better, worth a shot. Well i think i’ve slept my way here, had a few issues with my scar and the steri strips. We thought i had pulled and ripped open part of my pelvic scar so had to go to the Doctors to make sure the wound wasn’t infected and if open could it be closed again, neatly and heal nice and neat like the top area. Turns out to be ok, there is no infection and the skin was overlapping where there was dried blood and it had dried all lumpy and bumpy and made it look open and torn. Thank god this wasn’t the case and i can rest easy now. The wound itself has been so sore and achy with the dressings coming off and being poked, and even sitting upright has been hurting it. 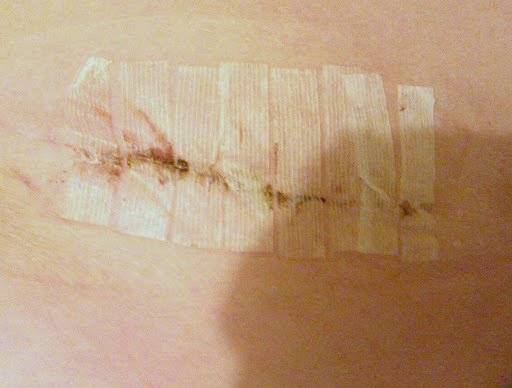 So this last week i’ve been taking it easy, lying down where possible and taking the strain off the wound site. This has made a huge difference this week, it’s been painfree mainly and the wound looks better in itself. I’ve tried to walk without one crutch in the house for the last week and a half with loads of success, i’m happy with the one, tried to do two steps without anything but sadly the left hand side does not want to hold me up without a HUGE limp, almost jump back onto the right side. So i think i will focus on getting stronger with the one crutch for now. Not done much physio this last week but thats about to change now that i feel much better. I went on the wii board today and did 10 mins free steps, it felt alright and ok except the right (yawn! this one again!) hip, and left knee. God knows what the knee was playing at, the hip i expected but not the knee! But as soon as i stopped the pain was relieved in the knee, but not the hip, so i know the hip pain is the same old same old. Damn these hips! Had my back to work interview over the phone as i said i’m not really in a position to go into the job centre as of yet, but made a new appointment in a few weeks time, as she has let me do it over the phone for the last year. So i owe her some back for being so supportive and understanding. She is going to help me reconsider what work i could possibly go back into, as Beauty therapy was heavy on my hips, from constantly sitting in one position for hours, or holding a standing position for ages too. I would seize up and the arthritis would kill me off. So i need a job that will allow me to sit and stand or walk around as needed, with flexibility for hospital appointments and physio. But how your ever meant to find just any job in this current climate is anyone’s guess, let alone one with loads of conditions too! I’m going to take it photos of my x-rays as i’d heard her getting loads of grief for letting me did to on the phone, so it will help to have a copy of the photos in my case file for her bosses. This one is the Femur one, messy but fundamentally ok, only about 6 inches long compared to the 12 inches before. Recovery is going well, when i’m allowed to recover and relax (not often for some reason!) I have to vent as i feel like i have the laziest family ever, My Hubby bless him is doing all the Dad chores as well as most of mine and the house bills, shopping etc… So this leaves some house work and washing up for the kids to do, Bare in mind they are 16, 13 yrs old i have a 10yr as well and she does what she can. But for some reason the 2 can not wash up 5 plates and cutlery without arguing and stropping and stomping off, which fills our house with negativity and stress, not good for someone that is meant to be relaxing and recovering after major surgery!! But besides my kid rant, recovery is ok i think, i have some some leg flexing and raising as physio’s said i could do any exercises i wanted to do straight away bar impact or jolting movements which is obvious. Hope everyone else is healing well, recovering well, sending you all healing thoughts and positive vibes. Also i was news to me that the muscle had been cut, that will be why i can’t clench my bum cheeks yet then? He lastly told me not to change my dressing for at least 10 days, better yet 2 weeks. No one had said this too me, only here’s your dressings but you don’t have to book an appointment to get stitches removed, so we were totally going to change them in a few days. He said we can’t because of the steri strips and glue, you have to leave them for 10 days minimum. Must of been a sign to send me back there to find that out, otherwise i could of wrecked my scar and opened it up by accident!! Hey girls, wow what a hassle that all was, lol The day i had surgery i had to be there by 7.15am on Weds and sadly i wasn’t seen until 3pm so i was cranky and annoyed by that point, ahead of me was injections guided by x-rays and bunions, but what i thought was bad was a diabetic being left until 2.30pm from 7.15am as well, i was proper worried about her as she was an old dear and shouldn’t of gone so long without food and water. They promised to move her upwards when she told them she was a diabetic but it never happened. By the time i was seen i’d gone from the whole i’m scared to pls rip them out so i can eat and drink again!! I’m not pleasant without coffee, i need at least 3 in the morning just to function. I woke up fine in Recovery and i was so happy i didn’t end up in HDU this time. I woke up so much better, not cold and scared like last time. As soon as i came round i saw that it was 5.40pm, thought surgery was only meant to be an hour?? Worried a little but no-one said anything? I was moved straight onto a ward with 2 knee replacements and 1 hip replacements, all old gals too. Nice bed mates but sadly 2 were quiet sick, and would throw up every time they saw or smelt food so that was hard to live with. The first night i had to stay in due to the latest of the surgery, so i was prepared for that too happen, and expected it once i saw the clock at 5.40pm. I sent a text to Rich to confirm where i was, and He and Jema popped up to see me on ward 3, They got to stay with me until 8pm which was lovely, such a difference from last time already. I felt fine just tired and weaker but ok. Where as last time i was proper shook up and wasn’t good for visitors. I was given some toast and coffee for my tea and that was my first meal. I couldn’t sleep sadly so didn’t have a good night at all, as the other ladies were throwing up proper loads (in fact one really really worried me, she was so poorly) The pain hasn’t been too bad, just been coping on Dihydrocodeine and Para’s with a bit of Oramorph if still sore. Crew came in at 6.00am to wake us all up and change the bed sheets and breakfast, i didn’t have my bed changed as i was going to go home, so i figured i would just occupy myself until dinner time, and perhaps get some sleep before i go home, seen as the night didn’t go well. I had some funny pains behind my knee, which i admit freaked me out a bit due to that being the location of the dvt last time, and the knee was pumping (or looked like it was breathing! Funny looking, until it dawned on me that the blood was struggling to get down the the lower leg. So i had to say something, it was quickly dismissed as nothing to worry about and everyone went about their day and jobs. About Dinner time it flared up again, which was annoying as other than this pain i was alright and coping well on the meds i was on. So i told the next nurse that came near me, while taking my blood pressure and stuff, i asked about going home and she said i think we are keeping you in. Gutted wasn’t the word, but they said it was due to the knee’s behaviour and the pain i was experiencing so in a way i was happy they decided to do this. The whole time the food has been vile, cold and too heavy and rich. The other ladies have been a mele of raspberry blowing, number 2’s on bed pans and sickness, i really wanted to leave. I did stay the next night and thankfully i no longer felt the pain nor has it twitched like it was beating, so first thing when they got us up at 6am again i told them i was going home, even if it meant discharging myself. I couldn’t stay with sickness and poo smells any longer, i really felt for them and worried over them, but thankfully by Friday dinner time everyone started to look much much better, mainly due to anti-biotic’s being stopped and blood transfusions being given (the difference was amazing to be honest). I was so pleased to be getting out of there, the noise the smells and the food. But it’s not all fun and light at home, sure i can eat hot food (thankfully) and drink coffee as often as i like, which is very very often! But the kids giggling and running around has made me very nervous, or they are fighting and screaming at each other, i think i was safer at Hospital. It felt so good to have my own bed though and to have tv again, but i miss being able to sleep during the day, and not having to talk (sometimes i just like quietness, where i don’t have to talk) But the 16yr old never ever shuts up and constantly wants answers and interactions with me. Hate being mean, but not strong enough for all that yet. Glad i have Rich telling them to leave me alone for now. Just need to get my bearings back, took me a while to text as well, as i felt like i didn’t have the head space for it. My scars are glued together and i have the steri strips too to hold it shut and it’s only partly the size of the 12 inch one, roughly about 6 inches, but the bikini one is the full 7 inches is open again. I feel ok and stable on the crutches and i’ve been told i can fully weight bear with them. I can do any exercises i want to do that don’t invlove jumping twisting or impact for now anyways. So i’m optimistic for the future of the Leftie anyway and building it back up, i’m sure once the shock of surgery has settled down then i will really feel the benefit from having the metalwork out. Hope i can get a couple of years though before i have to think of Rightie , and i hope i can settle down this SI joint pain, i too have feared it’s AS, may meant this in the post op appointment if the pain hasn’t gone by then.